Student Engagement: Not only does openly sharing work provide for a wider audience, it allows for a different sense of engagement. Whereas discussions are usually restricted, publishing to a blog provides a means of “broadening the perspective of the conversation with authentic audiences from around the world.” This is one of the points Alan November makes in his discussion of transformational learning. Appreciation of Digital Media: Often when students compose writing they have little appreciation for context. Publishing texts digitally provides for an appreciation of the constructive and creative aspects of digital media. For example, what colours, images and theme is appropriate for the content of the blog? Administration: One of the challenges with every digital medium is that they always require some sort of support. This can include resetting passwords, maintaining email accounts and setting up blogs. With limited class time, such administration can be a frustrating hurdle. Expectations: The ability to check student’s posts before they are made live is both a strength and a weakness. It is fantastic, because it provides a level of security and safety for students, teachers and parents. However, in today’s day and age of social media and instant messaging, when you have not reviewed students work to check if it is appropriate to be published, they get annoyed quickly. Be Patient: One of the dangers when introducing any tool or strategy is that we expect dividends from the start. This is often not the case. One of the reasons for this is that they required certain habits to become ingrained, before their full potential can be met. In regards to technology, Gary Stager talks about it becoming boring so that we can use it to focus on the real issue, learning. Start with Why: Before you introduce blogging into the classroom, you need to think about why you might be blogging. If you want students to interact with each other to provide feedback, then everyone writing a review on the same book or account on the same concept is not really going to work. 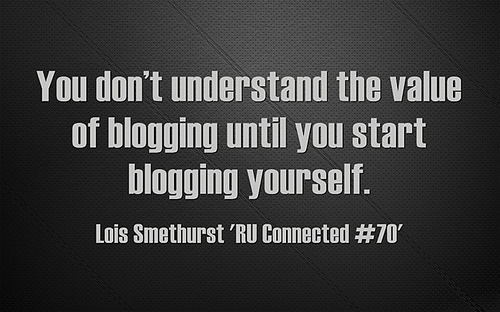 Blogging is an ideal platform for the creativity and self expression. See for example Anthony Speranza’s use of a class blog to showcase student projects. Tinker: Although you can read the posts I have shared or even Celia Coffa’s excellent unpacking, I think that the best way to learn about blogging is by tinkering. Start a personal blog. Explore, wonder, experiment. So what about you, what are your experiences? What questions still remain? As always, questions welcome. Blogging in the Classroom – A Reflection by Aaron Davis is licensed under a Creative Commons Attribution-ShareAlike 4.0 International License. Thanks for mentioning my post Aaron. Those thoughts were borne from watching countless teachers start blogs and quickly falter, lose enthusiasm and often give up. I have come to realise that I could have been more effective discussing the impact of being a connected educator first, then using blogging as a means to that end. 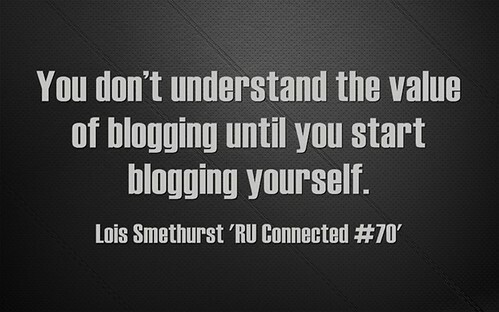 I spent countless hours teaching the mechanics of blogging to teachers who had no idea of how to connect their posts to an audience (or themselves for that matter). I acknowledge that some people blog personally with no real need of an audience but I believe that most professionals and all class blogs seek an audience. All about starting with why. Without that, technology is often doomed to fail badly. Really, that was the issue with the Ultranet. About 50 % of student blogs are public and 50 % of student blogs are private. There are pros and cons with both. I’m curious in your situation where you’re aware of the power of blogging as part of a global audience why you’ve set your student blogs to private. Hope you don’t mind me asking? In terms of helping educators appreciate the benefits of blogging as a connected learner I encourage them to read Kathy Cassidy’s Connected from the start: Global Learning in the Primary Grades. She shares powerful stories that explains the benefits of connected learning and shares tips on how to connect. I agree with what you are saying. A class blog is a good place to start. Really, the post stemmed from a question from a staff member who basically wanted me to outline all the intricacies associated with blogging in the classroom. My point was and is that sometimes you just need to do it and that is the only way to really appreciate it. In regards to remaining ‘private’. I am well aware of the potential, but it all comes back to context. The act of sharing ‘posts’ is innovative within my classroom. I think if we went straight to public that we might get the bends. My current setup is roughly fifty different blogs across three classes linked to a ‘class blog’. Slowly but surely wins the race. I agree. Blogging is something you need to do to appreciate it whether it be your own personal educator blog or starting off slowly with a class blog. I’m a strong believer in slow and steady wins the race. While I’m passionate about blogging as part of a global communities I also know there are some very successful private blogging programs; and lots of very valid reasons why specific privacies are chosen.